I was wondering why there is no outcry demanding to have this airplane come over here and deal with the California fires? Maybe if we make a stink, we can embarrass enough people and something will get done. The gargantuan Biscuit wildfire in Southern Oregon has now engulfed just under half-a-million acres since lightning ignited it and other western wildfires in mid-July. The magnificent 180,000-acre Kalmiopsis Wilderness within the Siskiyou National Forest resembles a moonscape. The rare plants, the wildlife, the trees that made the Kalmiopsis a special place v are gone. And the U. S. Forest Service says it cannot predict when the fires will be completely out v maybe in a month or two when the rains come. "This should never have been allowed to happen, and it need not have happened," says Tom Robinson, 55, a fire administrator and instructor of fire prevention with the Virginia Offices of Fire Programs and Emergency Services in Richmond, Va. Since 1996, Robinson has been waging a campaign to build public support for the deployment in this country of a Russian-made air tanker, the Ilyushin-76TD v nicknamed the "Waterbomber" v a rugged, airborne behemoth that can haul 11,000 gallons of liquid to a fire, nearly four times the carrying capacity of the C-130 Hercules, the largest tanker used by the Forest Service. At the invitation of its officials and to facilitate the acceptance of the IL-76, Robinson serves as volunteer international liaison, an official representative of the Russian Federation and its Ministry of Emergency Situations v EMERCOM v the Russian counterpart of the Federal Emergency Management Agency. EMERCOM is the agency that actually owns the Waterbombers. Robinson sees the IL-76 as a much-needed strategic weapon for the nation's firefighting arsenal. He is convinced that had it been called in when the Rodeo, Hayman and Biscuit fires began raging out of control, they would have been squelched before they became mega-blazes. 10-second drop [of liquid v water or retardant]. It puts a fireline down 300 feet wide and 3,900 feet long in 10 seconds. It would have saved every community in Colorado and Arizona this year. It would have saved those 300 homes in Los Alamos two years ago." Robinson said that two years ago during the Cerro Grande fire near Los Alamos, EMERCOM had two planes sitting on the runway in Moscow, fully crewed, each plane having three eight-man crews, ready to take off. They had been requested by FEMA, but at the last minute, FEMA told them they weren't needed after all. The Associated Press reported that then-District IX FEMA director Buddy Young went to the fire and publicly announced, "You will not bring the Russian planes in here: We're not having any Russians coming here and fighting our fires." But in fact, Robinson pointed out, this has nothing to do with the IL-76 being Russian-made and owned. The Canadians have their CL-215 tankers and CL-415 SuperScoopers. They developed the CL-215 v which Robinson considers superior to anything the United States has v in 1967, and they've been rebuffed by the Forest Service for 35 years. "They have not been able to come in and compete for Forest Service contracts because they are not a private contractor association," Robinson explains. "They're part of the Canadian government. It's a quasi-private, public-private partnership, but the Forest Service does not want its contractors to face outside competition." According to Robinson, the only place Canadian planes are used for firefighting is in Los Angeles County, which leases two of them every year and has for about 10 years, ever since the Malibu canyon fires. "The county figures, 'We can't trust the Forest Service to be here.' It was a mass debacle where they lost billions of dollars and all those multi-million-dollar Malibu homes. One insurance company lost $100 million in two hours." Robinson admits to being a "crusader" and even a "zealot." "That's because I've flown on missions on this plane v I know how good it is," he says. "This plane is ten times bigger than the average tanker they're using in Arizona and Colorado and Oregon, and because it's so heavy it can fly in windy conditions where smaller planes would be grounded." 90-feet long, four-feet in diameter, and capable of holding 5,500 gallons of water v a total of 11,000 gallons. 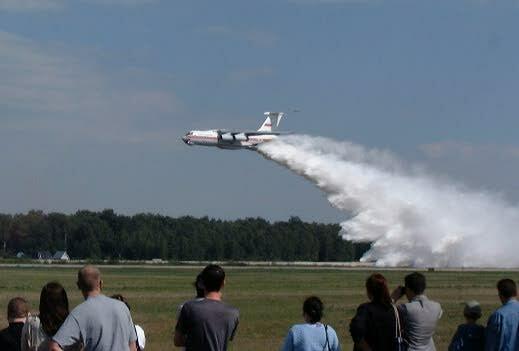 Unlike American tankers that have a pressurized system to dispense the retardant, the Ilyushin has a simple, virtually "bug-free" gravity-flow system. However, this system requires the aircraft to fly straight and horizontal. "The plane will be flying, say, 150 feet above the ground, at 151 knots [173 mph]," Robinson explained. "The water comes out at the same speed as the plane, as one big sheet of water. But when it gets about a hundred feet above the ground, it slows and comes down as a drenching rain. It's a big blanket of water that comes down vertically in much larger drops [than in the American pressure system]. It's so effective the Russians don't even use fire retardant in it." The Russian Federation has offered on several occasions to send the plane v or a pair of them v to the U. S., where it could demonstrate its effectiveness on one of the larger wildfires. They ask only for the cost of fuel and food and lodging for the crew. But officials in the USFS have consistently said thanks, but no thanks. Robinson hopes that this year v with more landscapes than ever blackened by fire v the Forest Service will break its long-standing opposition and agree at least to test the aircraft. But he is not holding his breath. The Forest Service is adept at deflating any interest a politician or member of the public might show in the Waterbomber, and officials of other agencies are likewise skeptical of its value in firefighting. "We are not interested in buying or using the IL-76 for several critical reasons," Forest Service spokesman Joe Walsh told the Colorado Springs Gazette in June, at the height of the Hayman fire. "The plane would not meet our firefighting needs." Walsh said the Forest Service has enough air tankers, "despite what commanders at many of the fires are saying. We're in good shape. We're not having any problems with our resources. We don't have any need for it." The plane is "too costly and lacks ability to make downhill drops, a necessary maneuver in fighting fires in the mountains. It actually drops too much water." "It's like wasting water," Walsh said. "Water is not a commodity we can just dump hundreds of thousands of gallons of and not worry about running out, especially in drought conditions." USFS aviation official Ed Stone shares Walsh's views. "We've had contact with this aircraft since 1994," Stone told ABC News in August 2000. "In the fires of 1994 there was intense political pressure to use it and bring it in, when we were actually holding [our own] planes down. We looked, and we didn't care for the product," he said. Dennis Lamun, head of Bureau of Land Management's Fixed Wing Program at the National Interagency Fire Center in Boise, Idaho, is similarly critical. "The only thing the IL-76 has in its favor is that it's big," Lamun told WorldNetDaily. "Not that it's sophisticated or technologically advanced, it's just that it's big. We build big airplanes in America, but we don't go out and tank them because they don't fight fire very well." "Bigger isn't necessarily better," he added. "The Forest Service has more 3,000-gallon, Type 1 air tankers than BLM does, but our philosophy at BLM is that we'd rather have two airplanes carrying 2,500 gallons each, that can go in two different directions, than one airplane carrying 5,000 gallons, because if I want all 5,000 gallons in the same spot, I can get it. "We have 54 600-, 700-, and 800-gallon airplanes, and we want more of them, and it isn't because we're ignorant that we don't trade all those smaller airplanes in for one big 10,000 gallon one. It's because we know what we want because we fight fire for a living." In addition to his work for BLM, Lamun heads the Interagency Airtanker Board that represents air tanker contractors and federal firefighting agencies. It is responsible for setting criteria for air tankers and overseeing the certification process. Robinson never expected such a degree of opposition when he became involved with those trying to bring the Ilyushin into this country. "I thought it would be easy," he said. In 1996 he was invited to join Global Emergency Response v a Canadian-Russian-American joint venture, created to sponsor the IL-76 in disaster mitigation around the world. The idea of a company that would arrange the leasing and use of the aircraft was the brainchild of Tom Edmison, president of Total Corporate Aviation Services, a Calgary-based aviation resource company. Formerly a chief pilot for Gulf Oil, Edmison had routinely flown a B-727 back and forth between Calgary and Russia for oil crew changes. On those runs he got to know the Russians and became familiar with the IL-76, "a marvelous, versatile workhorse." "When I started this I said to myself 'this is really something,'" Edmison recalls. "Here's a chance to do something entrepreneurial v and it's got peace and the environment written on it. It served everything: It was good business, good for the environment, and it has a tremendous peace message." He was surprised when the Forest Service didn't see it that way and began placing roadblocks in the way. Because of Robinson's contacts in the fire prevention community, Edmison and EMERCOM officials approached him, figuring that an American would be able to overcome bureaucratic objections to the IL-76. He agreed to serve as the fledgling group's chief administrator. He's made some progress among politicians, the media and the public, but the door to the Forest Service remains closed. 20 members of the media, including the BBC and Associated Press. Aviation specialist Joe Madar was enthusiastic, reportedly cheering, "My, God, will that thing ever stop dropping water. Perfect, perfect," as the tanker poured out its cargo of water in two passes before the grandstand. After the demonstration, Madar told a reporter he thought the aircraft could have been effective in the then-recent fires in California, Nevada and Colorado. The enthusiasm is lacking in his later written report, though Mader noted that the plane could be useful as a "supplemental firefighting resource." WorldNetDaily could find no one within the federal agencies who has actually seen the IL-76 in action. Apparently not one Forest Service or BLM ranger or fire fighter has decided to take a closer look. Robinson has. And it's that experience he says that changed him from being an enthusiastic supporter into a "zealot." It was in 1999, and Greece was enduring its worst wildfires in over a century. Infernos were raging in the mountainous terrain, and winds were so fierce the air tankers of the Greek Air Force were grounded. As he tells it, "There were two 3,000-foot-wide fires that were going unabated because of windy conditions through the mountains, burning all their monuments and forests. CNN was there and said it was unstoppable. But we filled up at the Greek Air Force base, then went to the first fire. We flew by on an observation run, came back around, lined up on the fire, judged the wind direction, opened the doors on the tanks v and whoosh v 10 seconds later we looked back and that 3,000 feet of fire was gone, absolutely gone." That took care of the first fire. The pilot returned to the base, the tanks were refilled, and they went to the second fire and put that one out just as quickly. "These fires had burned for a week, with hundreds of firefighters and all kinds of equipment brought in from Germany and other countries," said Robinson. "The Greek media called it a miracle." Though it convinced Robinson and the Greek public, the Greek government decided against future use of the Waterbomber, preferring instead to invest in a fleet of planes at $25 million each. In June 1998, Flagler Country in northeast Florida was ablaze. Fires were so bad the Daytona 500 had to be cancelled. Half-a-million acres were eventually devastated and several hundred homes destroyed. A standard criticism about the IL-76 is that it won't work in mountain areas: Flagler County is pancake flat. On June 22, EMERCOM made an offer to then-Gov. Lawton Chiles to bring in the Waterbomber and a crew. The plane would have been in Florida within 48 hours, Robinson said. All the Russians asked was that the state cover the costs of fuel and maintenance for the aircraft and food and lodging for the crew. A cap of $500,000 for 30 days was placed on the mission. At first, everything seemed to be moving without a hitch. The state of Florida said OK. Both the Federal Aviation Agency and the State Department gave their approval. The Florida Air National Guard was going to host the aircraft and its crew at Patrick Air Force Base. Suddenly the governor decided against the offer, and the whole thing fell through. At a press briefing Chiles tried to justify his decision. "The Forest Service told me that the plane was so big and carries so much water it would destroy homes and kill the firefighters," he said. Do people really believe this?, Robinson says he wondered in amazement. Not everybody, surely. Though the Forest Service would like to see it go away, the IL-76 has picked up supporters, including members of the firefighting community. James Harrison is a battalion chief with the Santa Barbara Co. Fire Dept. in southern California. In his nearly 40-year career as a firefighter he's fought both structure fires and wildfires. Harrison said he became aware of the IL-76 a couple of years ago v he does not recall the exact date v when a group of Russians came to the United States at the invitation of the U. S. State Department for a week-long session of disaster-preparedness workshops between officials from EMERCOM and local American counterparts. Harrison met the man who developed the IL-76, and became friends with the head of EMERCOM. They showed him a four-minute video clip of the plane taking off and making water drops. "All I can say is if the planes are half as good as what this man says they are, we should at least give them a chance," says Harrison. Harrison followed through by reading all the articles he could find about it, and so far has seen nothing that would make him change his mind. Asked if he thought the amount of water discharged is not really a good thing, Harrison laughed. "I think you need to be able to put it where you want," he said, and added, "That's why I'd like to be able to test this aircraft. I'd like to see the thing at work, because they [the Russians] tell me they can put it wherever you want. They tell me that they can put it in a line almost a mile long, and they tell me they can put it very wide for half a mile." Would he find that useful as a fire professional? "Absolutely," he exclaimed, and added that he didn't think being able to haul and drop 11,000 gallons "could possibly be a drawback." "I know the Forest Service disagrees with me, and I disagree with them," he said. "Whichever. But I don't understand why there's anything other than a political reason that I'm not aware off v that we wouldn't at least bring that plane over here and try it." Sarah Foster WorldNetDaily ©1999 "Pravda. RU". When reproducing our materials in whole or in part, reference to Pravda. RU should be made. Let us swallow our pride, admit our mistakes, and start doing the right thing. The only reason why it is not allowed to be used here is because of the NIH mentality of our fellow americans. NIH stands for "not invented here" mentality. Politicians are like that, they wanted something homemade that they can use as a vote getting and campaing fund getting project (from contractors who'll get the big bucks and expresses their thanks in the form of campaign fund contributions). And the minute somthing went wrong, off they go to the "blame shifting and passing the buck" merry-go-round strategy inorder to avoid their responsibilities. These CL-215s seem to have been ignored, too. Quebec offers more aid to California MONTREAL - Quebec is offering increased aid to authorities battling severe wildfires across southern California, where flames stretch from the Mexican border to Los Angeles. The province already has a contract to supply Los Angeles County with two water bombers each fall. But the government said it is willing to send more planes if the state asks for help. Gerard Lacasse, a spokesperson for SOPFEU, Quebec's fire protection agency, said the province's two water bombers have already been called into action. He said that Quebec is willing to send up to three more planes if necessary. "If we have a request for any resources we're going to look at it," said Lacasse. "And if they need water bombers like we have here, it's going to be possible because we have a lot of those machines right now available because the fire season is over here." The fires in California have already destroyed nearly 2,000 square kilometres of land and have made their way to the suburbs of San Diego and Los Angeles. Lacasse said that Quebec is currently seeking contracts with other municipalities south of the border to maximize the use of the province's planes.